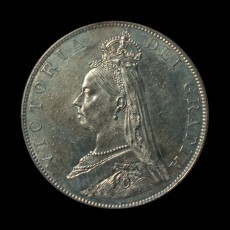 The Double Florin is a British coin produced between 1887 and 1890, with Victoria coins produced between 1887 and 1890. The equivalent decimal currency value of the Double Florin would be 20 pence. 1887 Double Florin mintage figure: 483,347 coins. 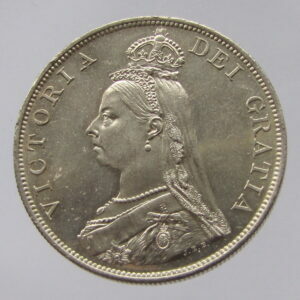 (This figure may be approximate and may not include all circulation and proof coins minted with the date 1887). 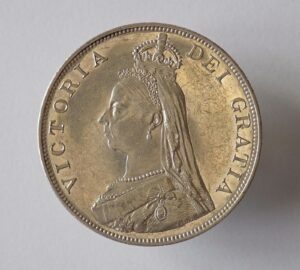 The coin is made of sterling silver, 36mm in diameter and weighs 22.6 grams. A sterling silver value of £0.35 per gram would mean this coin would have a scrap metal value of about £7.91. Buy direct from M. Veissid & Co.
Buy direct from B&G Coins. Buy direct from AMR Coins.